San Luis Obispo, CA—Jewelers Kevin and Kathi Main have announced plans to retire after 45 years in business. 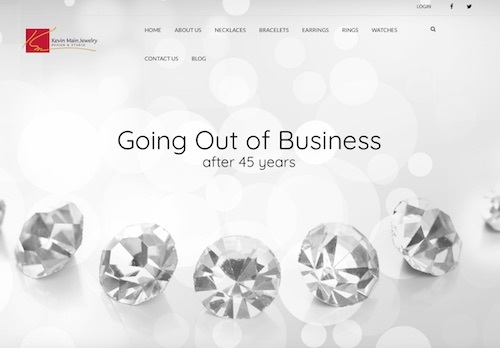 They’re the latest in a list of prominent high-end jewelers (G. Thrapp, Stanley Jewelers Gemologists; Dorfman; Beauchamp Jewelers and more) that have closed in the past few years. Kevin Main Jewelry Design & Studio (image left, The Tribune, San Luis Obispo) has been a 20-year fixture in downtown San Luis Obispo, located next to the town’s most popular restaurant. Owners Kevin and Kathi Main have weathered both an earthquake and the 2008 recession, but now they say it’s time to let go while the letting is good. 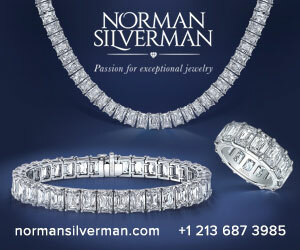 The Mains told National Jeweler they want to go out on a high note. They plan to travel—particularly to visit friends they’ve made in the jewelry industry—and Kevin Main wants to spend more time pursuing his passion of ultra-distance cycling. Years ago, Main told The Centurion Newsletter that cycling has helped him in business, because you have to be very focused in both pursuits. 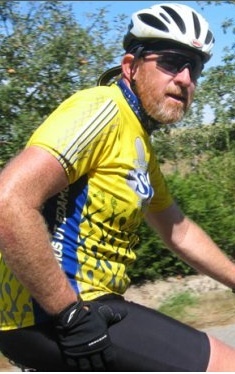 Kevin Main in bicycle gear. "Bicycle riding, at this level, something happens. Something hurts, something breaks, you have to work through it, just like you do in a business. And it helps with focus and commitment for life. It all correlates on different levels." Kevin Main got his start in the business as a lapidary cutting turquoise, before opening a one-man sterling silver design studio with a $200 loan from his father. 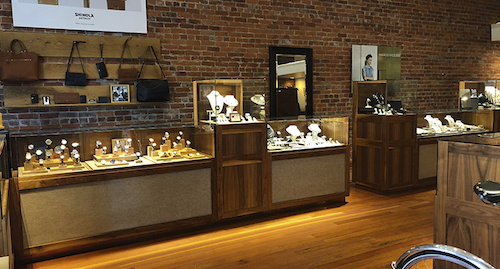 That little shop grew into a high end AGS jeweler, selling brands like Alex Sepkus, Forevermark, Marco Bicego, Alishan, Shinola, Hearts On Fire, Precision Set, and more. The Mains purchased their building in 2004, knowing it would need seismic retrofitting following the 2003 San Simeon earthquake, a 6.6 magnitude on the Richter Scale. They remodeled it in 2008. Kevin Main's homepage announces the store's closing. The jeweler is kicking off the closing sale with a private event on Wednesday, November 14, and opening it up to the public—with prices up to 70% off—starting Thursday, November 15 at noon. Main anticipates all merchandise to be sold by year’s end, and he’s hoping to be able to lease the space, furniture, fixtures, and database as a turnkey operation to another jeweler. Seattle, WA—33-year-old Lisa Bridge has been promoted to CEO of Ben Bridge Jeweler, the fifth-generation family-run jewelry chain with 95 stores in 11 states and one Canadian province. Ed Bridge, the current chairman and CEO—and Lisa’s father—announced Tuesday that he plans to retire effective January 31, 2019. Lisa Bridge, having been promoted to president and COO last year, has been promoted to president and CEO. She is the store’s first female president and also its youngest, distinctions she carries into her new position as well. 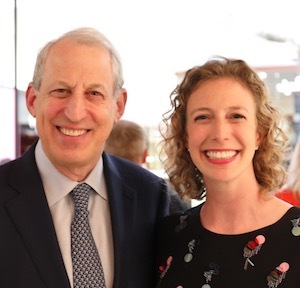 Father and daughter leadership: Ed Bridge, left, outgoing CEO of Ben Bridge, is turning the reins over to daughter Lisa Bridge. Lisa Bridge grew up in the family business, cleaning the store counters as soon as she was tall enough to reach them. She graduated with honors from Washington University in St. Louis, MO, and attended the Gemological Institute of America in Carlsbad, CA. Her formal career launched with time spent in Ben Bridge’s buying department, developing both her passion for gemstones and understanding of the source and design process. Prior to her promotion, Bridge had been the company’s vice president of education for seven years, overseeing the education and professional development of the company’s 1200 associates. She is very active in the American Gem Society. Ed Bridge will retire with a 45-year legacy of honor, leadership, and achievement, including serving as chair of Jewelers of America and Jewelers For Children, board member of the Jewelers Vigilance Committee and the Jewelry Information Center in the industry, and in Seattle, as vice president of the Jewish Federation of Greater Seattle, chair of the Seattle Victims Fund, board member of both the University of Washington Hillel and Tyee Clubs. 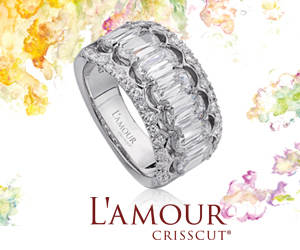 He has been the recipient of the AGS Lifetime Achievement Award and numerous honors including being inducted into the National Jeweler Retailer Hall of Fame. Since taking the helm as president in 2017, Lisa Bridge has put her passion into transforming the in-store experience to achieve a stronger relevance for the new generation of fine jewelry consumers while preserving the welcoming environment loved by Ben Bridge loyalists. The innovative retail atmosphere highlights the company’s unique heritage, which will continue to roll out in 2019 to additional stores. Additionally, Ben Bridge Jeweler enhanced its “Made for You, For Life” campaign this year, building on the company’s core differentiators. Lisa and her team will also be launching Bella Ponte for holiday 2018, an exclusive collection of fully customizable engagement rings and wedding bands.